Saving in a College Savings Iowa 529 Plan now could cost you much less than borrowing money later. Considering the high cost of college and today's economic climate, you may think it is better to just wait and borrow the money when it comes time for college. But saving in a 529 plan like College Savings Iowa can make a big difference in the amount of debt your child or grandchild will carry. "Investing in a college savings plan before it is time for your child to attend class can cost a lot less than paying interest on a loan long after he or she graduates." In this scenario a family starts investing $25 a week in a College Savings Iowa 529 Plan account when their child is born. In 18 years when the student is ready to go to college, the family will have saved $23,400. 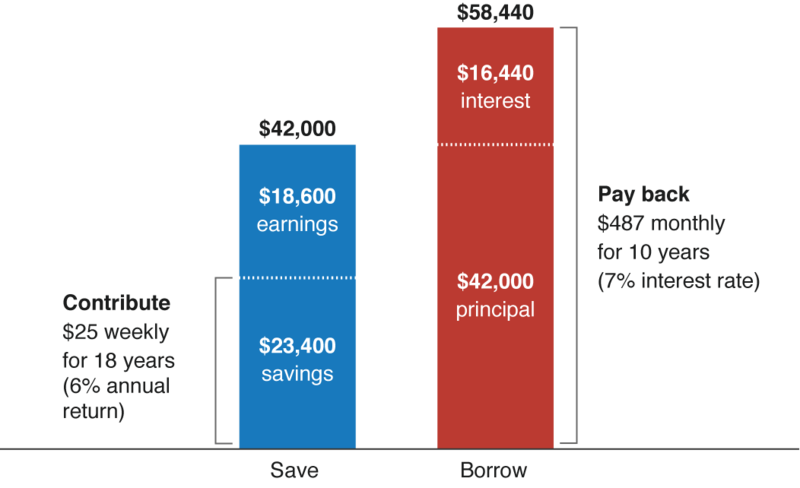 If you compare the "save" scenario with the "borrow" scenario, you can see that saving regularly for college could end up costing $35,040 less than borrowing! $42,000 for college: Save or borrow? This hypothetical example is for illustrative purposes only. It does not represent an actual investment in a particular 529 plan nor does it reflect the effect of fees and expenses. It assumes the account earns a 6% annual return and that no withdrawals were made during the period shown. The final account balance does not reflect any taxes or penalties that might be due upon distribution. Your actual investment return could be higher or lower. This graph compares two hypothetical scenarios. In the "save" scenario, $25 is contributed to a 529 plan account weekly for 18 years, resulting in a savings of $23,400. Assuming a 6% annual rate of return, those savings earned another $18,600, bringing the final account balance to $42,000. In the "borrow" scenario, a $42,000 loan taken at an assumed 7% interest rate, resulting in a total amount owed of $58,440 ($16,440 in interest).To pay it back, the borrower would need to make monthly payments of $487 for 10 years. Most families combine some level of saving and borrowing when paying for college. However, if you set aside money early and often in a tax-deferred savings vehicle, like a College Savings Iowa account, you can build up your savings and hopefully have to borrow less. Over time, regular contributions can potentially add up and become a college nest egg for you and your student. *The College Board, "Trends in College Pricing 2015." **A plan of regular investment cannot ensure a profit or protect against a loss. ***Hypothetical loan details are for illustrative purposes and do not represent the actual terms and conditions of a student loan. Actual terms, including interest rates, will vary.